Is there any hope for minorities after the general elections of 2018? By all standards, the elections were held in a controlled environment, and it is hard to say that they were free and fair. Five major political parties insisted that the elections were rigged. Their polling agents were intimidated and were not allowed to be present during the vote count. Many agents were not given the official copy of the results. Many urban constituencies’ results came very late. In those constituencies, Imran’s opponent parties were stronger. The Human Rights Commission of Pakistan (HRCP), an independent body, observed that some polling staff appeared to be biased towards certain political parties. In 2013, Imran did not accept the results of the elections. By month-long sit-in Islamabad, he tried to destabilise the government of Nawaz Sharif, former prime minister, and the leader of the party, Pakistan Muslim League-N, who ruled the country from 2013 to 2018. Khan did not attend the Parliamentary sessions but draws the salary an MNA regularly. Many of Khan’s critics call him ‘Taliban Khan’ because of his soft approach towards the Taliban, a brutal force that operates in Afghanistan and Pakistan, and his conservative agenda on many political, social, cultural and legal issues, including controversial blasphemy laws. From Khyber Pakhtunkhwa’s budget, where his port was in power, he denoted more than $3 million to the head of Darul Uloom Haqqania’s Sami ul Haq, who is notoriously known as the ‘father of Taliban.’ According to Washington Post, “Some called him (Khan) puppet of the military. Khan has often publicly praised the military but has denied any collusion. Imran’s main slogan was anti-corruption, but near the elections, he accepted the same corrupt and discredited politicians in his party. Despite his all weaknesses, Imran is popular among the urban youth. Because of Imran’s influence, these young educated people had been using the social media in an indecent way. They fiercely promoted intolerance and hatred by using insulting and offensive language against Imran’s opposition parties. A senior journalist Imtiaz Alam called them abusive brigade. Imran’s interview on BBC (Hard Talk) before elections exposed him when he seemed helpless to answer many critical questions about national and international issues. On the other hand, Bilawal Bhutto, 29, son of Benazir and leader of PPP, seemed very confident when he appeared on various TV channels. The election manifesto of PTI proved that it is a less progressive. In a controlled environment, religious minorities have less space to play their role in the national elections. However, it was the first time in the history of Pakistan that many minority candidates contested elections on a few general seats under joint electorates. For example, Sunita Parmer was the first a Hindu scheduled cast woman who contested on a general seat from Thar, Sindh province. Although, the winning chances of minority candidates were slim, contesting on the general seats showed that the joint electorates have given them space to enter into the national politics. As it is first time in the history of Pakistan, three Hindus from Sindh province were elected MNA and MPAs on general seats on PPP’s tickets, where the Muslim voters were 90 percent. Many minority candidates will become the member to the National and Provincial Assemblies through the reserved seats through proportional representation. Conversely, minorities have less hope for their future because a conservative government will run the country for the next five year. 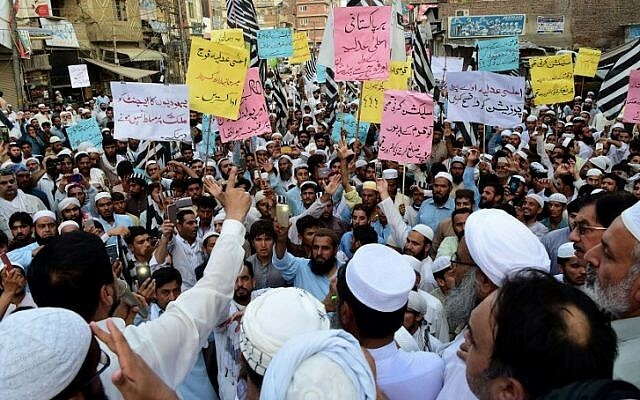 Even so, a few like the Church of England Bishop of Lahore Irfan Jamil hopes that the government of Imran Khan will take actions against hatred and mob violence against Christians. Only the time will tell that if minorities get a breathing space in their own land. Minorities (Christian, Hindu, Ahmadis, and others) make up just 4 percent of Pakistan’s 200 million population.